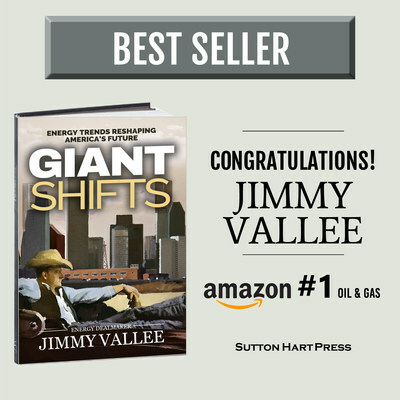 HOUSTON, May 17, 2017 /PRNewswire/ -- America's #1 energy dealmaker Jimmy Vallee, adds Best Selling Author to his high profile bio as his book: Giant Shifts – Energy Trends Reshaping America's Future (Sutton Hart Press) hit #1 on Amazon in Oil & Energy the first week on sale. Hailed as the Oil Industry's New Prophet, author Jimmy Vallee's Giant Shifts takes readers inside the trillion dollar high stakes energy industry with A Bold and Provocative Look at Oil's Past, Present and Future. Houston's Big Future – The Texas city's quick evolution Silicon Valley style as the hub of U.S. oil technology, finance, training and entrepreneurship. And, the Geopolitics of Oil wherein Vallee opines on possible futures for the U.S. depending on policy and economic decisions leaders make today in the new OPEC-down America-up energy landscape. Well researched facts and wise opinion from the new successor to Pulitzer Prize winning energy writer Daniel Yergen, Jimmy Vallee's Giant Shifts is the new oil industry Bible. Available now in Kindle and Hardcover. Jimmy Vallee: Houston-based energy dealmaker, M&A attorney and blogger. Quarterbacks multi-billion dollar public and private energy deals. Advisor to global and regional oil companies, private equity firms and oil industry expert for media outlets including U.S News & World Report, Bloomberg, Wall St. Journal, USA Today and others. Sutton Hart Press: Award winning non-fiction publisher of extraordinary and valuable content by high authority thought leaders across many specialties.